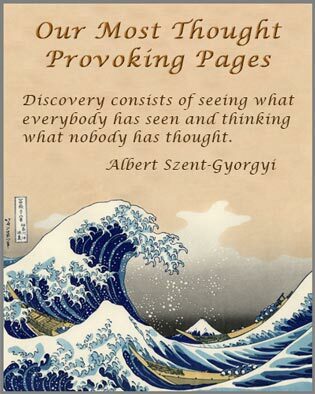 The problem contains counterintuitive behavior that cannot be understood by examination of the problem. The problem has such endless complexity that every time you approach solving it, you turn away baffled. 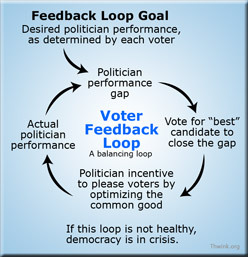 Feedback loops are at the heart of problem behavior. Multiple solutions are possible but it's hard to determine their relative differences of cost, speed, and/or effectiveness. The root causes of the problem are well hidden and hard to find. 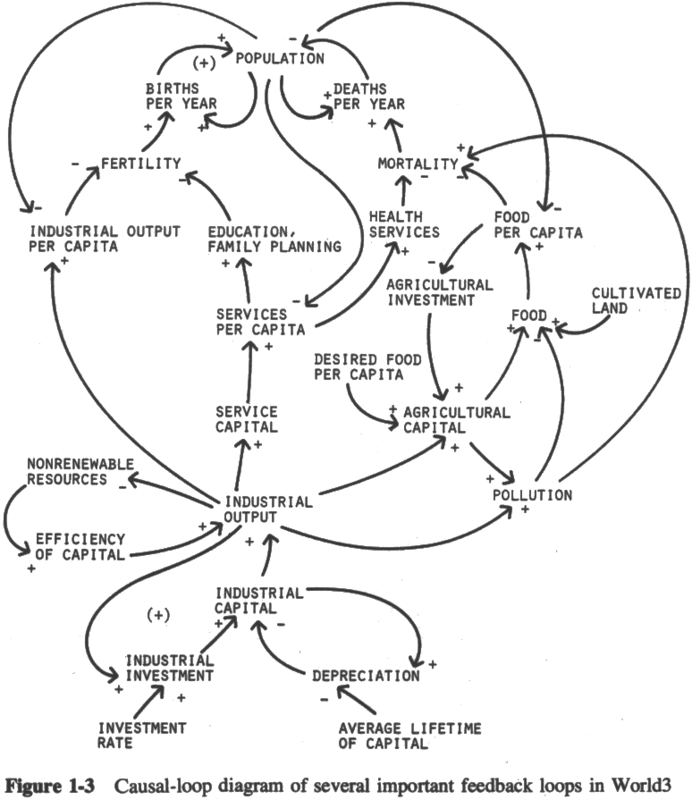 The sustainability problem has all these characteristics. Many problem solvers are modeling the problem. But they are not modeling the complete problem all the way down to its root causes. Instead they are modeling a subset of the problem, like the symptoms of climate change and its immediate causes, the IPAT Equation factors (as in The Limits to Growth World3 simulation model, high level model shown), and proper practice solutions like wind energy or life cycle product design. The two main types of models are physical models and mental models. The purpose of physical models is to enhance our mental models so we can make better decisions. The most important type of model is the mental models each of us uses in our day to day existence, because all conscious decisions are based on mental models. We have mental models for how our neighborhood works, for how a car works, for how a country works, and so on. We also have mental models that we have built ourselves to do things like perform our jobs, participate in running our households, interpret the news, and so on. And then there are the mental models currently used to approach problem solving, such as the global environmental sustainability problem. It is this last mental model that Thwink.org seeks to change, by showing that current mental models, such as those based on Classic Activism, are not nearly as productive as the more appropriate models that can be built using an analytical approach and the rest of the concepts in this glossary. Physical models also fall into two classes: those that cannot be simulated (static) and those that can (simulation). Examples of static models are white board drawings, causal loops diagrams, numerous types of analysis diagrams, and a drawing of a football play. All capture how something works. Static model are useful in the early stages of developing simulation models. If a problem is complex, and especially if it contains dynamic behavior over time that's hard to understand, then it must be analyzed using a simulation model. Predicting the weather, analyzing the causes of climate change and its likely future, and many business and science problems fall into this class. A simulation model (an example is shown) represents how a system works by capturing its fundamental structure and allowing that structure to be simulated over time, usually via computer software. Some simulation models are mechanical, like the many beautiful models of steam engines in the British Museum. Most models are descriptive. A descriptive model describes how something works. If a simple problem is being modeled, a descriptive model is usually good enough to solve it. For example, a model of an industrial manufacturing process could be the steps required to perform it and process flow diagrams if necessary. If a problem occurs, you inspect and test the process to isolate the problem to the step causing it. Then you modify the step so the process no longer produces defects. A large drawback is the descriptive model approach will not work for complex system problems, because the system is too complex to descriptively model completely or accurately. Examples of systems falling into this class are cultures, organizations, the universe, political dogmas, and a snowstorm at the molecular level. The standard solution to the complexity constraint has been to model the portion of the system that, if understood, will lead to solution of the problem. But how do you know what portion to model? And how do you know HOW to model it so that a solution is easy to derive from the model? There are no tried and true answers to these questions using the strategy of modeling the “right” portion of the system, because the “right” portion must be intuitively found. The result is that most such efforts fail. Eventually, given enough time, luck (trial and error) leads to a workable solution. 1. Use a formal process that drives all modeling. 2. First diagnose why the problem is occurring at the fundamental level before any solution hypothesizing begins. 3. Deliberately model with leverage points in mind. The emergent property of these three strategies is prescriptive models that are an order of magnitude more likely to lead to an acceptable solution in time. The second strategy is the key. Approximately 80% of a problem solver's time should go to the diagnostic step. The better it's done, the easier all remaining process steps are. 1. Identification of the structure that is causing such strong change resistance that this is a difficult problem, and not an easy one. 2. Identification of the intuitively attractive low leverage points that problem solvers have been pushing on in vain for so long. Once these two insights are reached, prescriptive modeling moves on to identification of the high leverage points that, when correctly pushed, will cause the change resistance to be mostly disappear. This is usually easy to do, because the high leverage points are probably already in the model. They are a natural part of the diagnostic structure. If they are not, then you probably have a shallow diagnosis. Finally, once the high leverage points are found, prescriptive modeling moves into testing how to best “push” on them. This requires experimentation. If this is done right, the experiments that work may be seamlessly scaled up into the actual solution. All in all, a prescriptive modeling approach is the only way to solve difficult social system problems, unless of course you prefer to rely on luck. 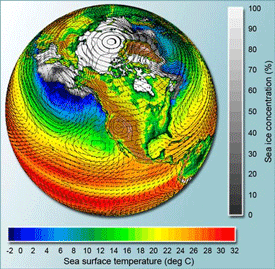 (1) The climage change model is from this article on How Do Climate Change Models Work? Philosophy [i.e., physics] is written in this grand book—I mean the universe—which stands continually open to our gaze, but it cannot be understood unless one first learns to comprehend the language and interpret the characters in which it is written. It is written in the language of mathematics, and its characters are triangles, circles, and other geometrical figures, without which it is humanly impossible to understand a single word of it; without these, one is wandering around in a dark labyrinth.